Pearcea was originally described as a monotypic genus. A second species was later added by Mansfeld (1936). 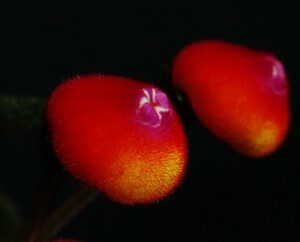 Subsequent analysis led to an expansion to about 17 species by the inclusion of Parakohleria, a few species of Kohleria and the description of new species. Conspicuous is the range of flower shapes, including the practically spherical flowers of P. hypocyrtiflora. It is distributed primarily in northern South America, in the eastern Andean slopes and adjacent lowlands from N. Colombia through Ecuador and Peru to NW Bolivia. The genus occurs in a range of habitats, from lowland rainforest (below 700 m) to cloud forest above 2500 m. The lower montane forests are particularly rich in species of this genus. There are relatively few species in cultivation, although P. hypocyrtiflora is widely grown and appreciated for its beautiful foliage as well as its peculiar flowers.